U Thet wandered all over Burma in his fervent search, visiting mountain retreats and forest monasteries, studying with different teachers, both monks and laymen. Finally he followed the suggestion of his first teacher, Saya Nyunt, to go north to Monywa to practice with Ven. Ledi Sayadaw. U Thet was accompanied in his wanderings by a devoted companion and follower, U Nyo. During these years of his spiritual searching, U Thet's wife and sister-in-law remained in Pyawbwegyi and managed the rice fields. In the first few years he returned a few times to see that all was well. But when he found that the family was prospering, he began to meditate more continuously. U Thet stayed with Ledi Sayadaw for seven years in all, during which time his wife and sister-in-law supported him by sending money each year from the harvest of the family farmland. After seven years, accompanied by U Nyo, he returned to his village, but he did not return to his former householder's life. Ledi Sayadaw had advised him at the time of his departure to work diligently to develop his samadhi (concentration) and panna(purifying wisdom) so that eventually he could begin to teach. They invited him for tea and a meal. He procured the books and explained to his wife that he was now living on eight precepts and would not be returning to the usual householder's life. From now on they would be as brother and sister. His wife and sister-in-law invited him to come to the house each day for his morning meal and happily agreed to continue supporting him. He was extremely grateful for their generosity and told them that the only way he could repay them was to give them the Dhamma. Other relatives including his wife's cousin, U Ba Soe, came to see and talk with him. After about two weeks, U Thet said that he was spending too much time coming and going for lunch, so Ma Hmyin and Ma Yin offered to send the noon meal to the sala. At first the people in the village were reluctant to come to him for instruction. They misinterpreted U Thet's zeal, thinking that perhaps after the grief of his losses and his absence from the village, he had lost his senses. But slowly they realized from his speech and actions that he was indeed a transformed person, one who was living in accordance to Dhamma. Some of U Thet's relatives and friends requested that he teach them meditation. U Ba Soe offered to take charge of the fields and household responsibilities. U Thet's sister and a niece took responsibility for preparing the meals. U Thet started teaching Anapana to a group of about fifteen people in 1914, when he was forty-one years old. The students all stayed at the sala, some of them going home from time to time. He gave discourses to his meditation students, as well as to interested people who were not practicing meditation. His listeners found the talks so learned that they refused to believe that U Thet had very little theoretical knowledge of the Dhamma. Due to his wife and sister-in-law's generous financial support, and the help of other family members, all the food and other necessities were provided for the meditators who came to U Thet's Dhamma hall - even to the extent, on one occasion, of compensating workers for wages lost while they took a Vipassana course. After teaching for a year, in about 1915, U Thet took his wife and her sister and a few other family members to Monywa to pay respects to Ledi Sayadaw, who was about seventy years old at that time. When U Thet told his teacher about his meditation experiences and the courses he had been offering, Ledi Sayadaw was very pleased. It was during this visit, that Ledi Sayadaw gave his staff to U Thet, saying, "Here, my great pupil, take my staff and go. Keep it well. I do not give this to you to make you live long, but as a reward, so that there will be no mishaps in your life. You have been successful. From today onwards, you must teach the Dhamma of rupa and nama (mind and matter) to six thousand people. The Dhamma known by you is inexhaustible, so propagate the sasana (era of the Buddha's teaching). Pay homage to the sasana in my stead." As his sister-in-law had predicted, many did start coming, and Saya Thetgyi's reputation as a meditation teacher spread. He taught simple farmers and labourers as well as those who were well-versed in the Pali texts. The village was not far from Rangoon, which was the capital of Burma under the British, so government employees and urbanites, like U Ba Khin, also came. As more and more meditators came to learn meditation, Saya Thetgyi appointed as assistant teachers some of the older, experienced meditators like U Nyo, U Ba Soe, and U Aung Nyunt. The centre progressed year by year and there were up to two hundred students, including monks and nuns, in the courses. There was not enough room in the sala, so the more experienced students practiced meditation in their homes and came to the sala only for the discourses. From the time he returned from Ledi Sayadaw's centre, Saya Thetgyi lived by himself and ate only one meal a day, in solitude and silence. Like the bhikkhus, he never discussed his meditation attainments. If questioned, he would never say what stage of meditation he or any other student had achieved, although it was widely believed in Burma that he was an anagami (person having achieved the last stage before final liberation). He was known in Burma as "Anagam Saya Thetgyi." Since lay teachers of Vipassana were rare at that time, Saya Thetgyi faced certain difficulties that monk teachers did not face. For example, he was opposed by some because he was not as learned in the scriptures. Saya Thetgyi simply ignored these criticisms and allowed the results of the practice to speak for themselves. On one occasion some of the rice labourers who worked on his farm took advantage of him, accusing him of withholding their share of the harvest. Although he had retired from any direct involvement in the farm management, he went out of his way to settle the affair so that the accusers would not continue to generate anger and thereby create more unwholesome conditioning for themselves. He had twenty water buffaloes that had tilled his fields for years. He distributed them to people who he knew would treat them kindly, and sent them off with the invocation, "You have been my benefactors. Thanks to you the rice has been grown. Now you are free from your work. May you be released from this kind of life for a better existence." Saya Thetgyi moved to Rangoon both for treatment and to see his students there. He told some of his pupils that he would die in Rangoon and that his body would be cremated in a place where no cremation had taken place before. He also said that his ashes should not be kept in holy places because he was not entirely free from defilements that is, he was not an arahant (fully enlightened being). One of his students had established a meditation centre at Arzanigone, on the northern slope of the Shwedagon Pagoda. Nearby was a bomb shelter that had been built during the Second World War. Saya Thetgyi used this shelter as his meditation cave. At night he stayed with one of his assistant teachers. His students from Rangoon (including the Accountant General, U Ba Khin, and the Commissioner of Income Tax, U San Thein) came to see him as much as time permitted. He instructed all who came to see him to be diligent in their practice; to treat the monks and nuns who came to practice meditation with respect; to be well-disciplined in body, speech and mind; and to pay respects to the Buddha in everything they did. In a village across the river from Rangoon lived a farmer by the name of U Thet. Every year, after harvesting his crop, this farmer traveled up and down the country in search of someone to teach him meditation. Eventually he found a teacher who showed him how to concentrate his mind by observing respiration. For seven years he went to this teacher, spending months at a time with him, and achieved great mastery in concentration. He then went in search of someone to teach him Vipassana meditation and, fortunately, he encountered the Venerable Ledi Sayadaw. This respected monk found him to be a worthy pupil, and for seven more years, U Thet kept visiting Ledi Sayadaw, and attained proficiency in insight as well. A wish to help others learn the technique arose, so with the permission of Ledi Sayadaw, he returned home and offered to teach the technique to his fellow villagers. But at first no one would come to him. "What can this man know about the Dhamma?" people scoffed. "He is a layperson like us. His head is not shaven and he does not wear the orange robe of a monk. What can he know about Vipassana?" Saya Thetgyi, however, was not disconcerted. On his farm were some hired laborers. He summoned them and said, "Ordinarily you work in the fields but, if you are willing, I will give you the same wages for working in my house." "As you like, sir. It's all the same to us, as long as we are paid." Saya Thetgyi led them to a curtained room. "All right, now," he said, "Sit down, close your eyes, and focus your attention on your breath." The men were astonished. "Is this the work we have to do here? Our master has gone crazy!" they thought to themselves. "He says that he will pay and feed us just to watch our breath! Well, if that is what he wants us to do, we'll do it!" And so they followed the instructions of Saya Thetgyi. These workers passed through the process of Vipassana and emerged smiling and happy. Whatever the motives that bring people to courses, if they work in the proper way they are bound to get results. Whether one is an illiterate laborer or a highly educated professor, the technique works just the same. After the course the laborers began to tell others. "Our master can teach a wonderful technique of meditation that brings real peace of mind!" But no one would listen to them, thinking that U Thetgyi had paid his workers to sing his praises, in an attempt to attract students. After a few months, however, it became clear to the whole village that a big change had come in the workers of U Thetgyi. Many of them had been rough and rowdy characters, always drinking and fighting, but now they were mild-mannered and peaceable. Becoming curious, the villagers began to ask these men, "What was it that your master taught you?" The men explained as best they could, and the villagers could not help but be impressed: "Well, that is what the Buddhist scriptures say. Perhaps this man really does know something. Let us go to him just to see what he teaches." So they did. 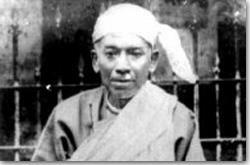 Thus, Saya Thetgyi became renowned as a Vipassana teacher and the foremost disciple of Ledi Sayadaw. Among those who came to learn meditation from Saya Thetgyi was a Buddhist scholar, a very learned man. Unfortunately he seemed to be more interested in the theory of Vipassana than in experiencing it himself. Still, he completed his ten-day course successfully, and left well-pleased with what he had accomplished. A few months later this man returned to visit Saya Thetgyi, and respectfully placed before him one or two volumes. "Sir," he said, "I have written a book explaining how to meditate, and I have dedicated it to you as my teacher." Saya Thetgyi asked, "Are only these copies that you brought here dedicated to me?" "Oh no, sir! All contain the dedication." "Well, if you wish to dedicate them all to me, bring all the copies of your book here." The scholar happily agreed to do so, thinking perhaps that Saya Thetgyi would perform a ceremony to bless his work. After a few days he returned with a carload of books. "Are these all the copies of your book?" asked Saya Thetgyi. "Yes, sir," the man replied proudly. "Very well," said Saya Thetgyi, "Put them in the fallow field over there." The scholar did as Saya Thet directed, arranging the books in a neat pile. "Now," said the teacher, "Go the kitchen and get a bottle of kerosene and some matches." "Kerosene, sir? Matches?" The man was bewildered. What use could Saya Thetgyi have for these in the ceremony? "Yes, kerosene and matches." Once again the scholar did as he was told, though somewhat reluctantly. When he returned with the bottle and matches, Saya Thetgyi said, "Good! Now sprinkle the kerosene over the books and set them alight." The scholar could restrain himself no longer. "What, sir! You must be joking! I have laboured so many months to write this book." Saya Thetgyi replied, "You would have better used your time to meditate. How can you explain meditation to others unless you have meditated deeply yourself? And even if you yourself had understood it properly, how could you expect others to learn meditation from a book? They would only burn themselves as surely as children playing with fire. Better to burn the books!"